This post is contributed by Lynn Steinberg, Roots Ethiopia Board Member, and member of the 2014 & 2015 Ethiopia Field Visit Team. 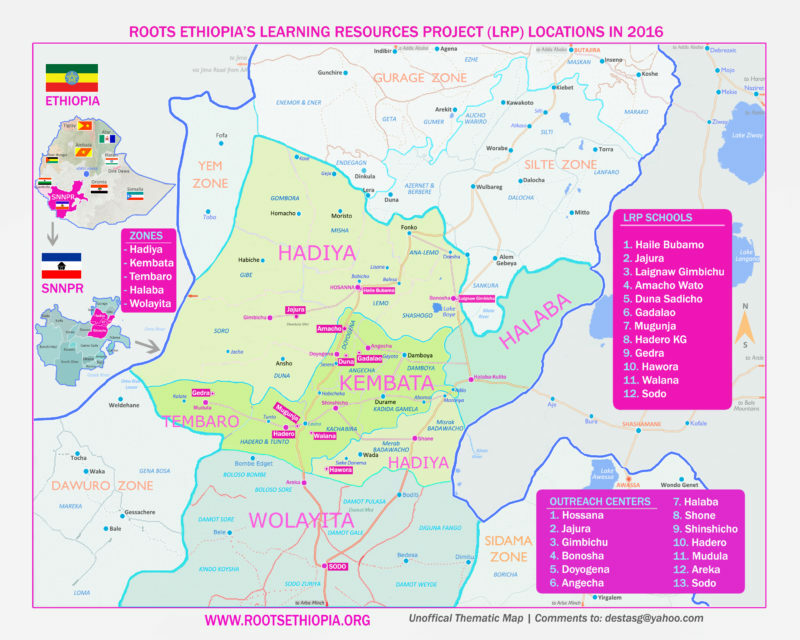 When I first started volunteering at Roots Ethiopia in 2013, I remember being completely moved when I read the update about the Amacho Wato Learning Resource Project (LRP) in Doyogena, Ethiopia. I had literally stumbled upon a grassroots, community-led organization operating in a region of Ethiopia that held a special place in my heart. I was “non-profit smitten” to say the least. Books and desks were delivered to ninth and tenth-grade students at this rural school. This would increase students’ chances of passing the critical 10th grade National Exam in Ethiopia. Until this project, the students in this rural Kembata village had no textbooks to study from and no library space, making their chances of passing the test minimal at best. Students must pass the 10th-grade exam in order to move on to grade 11. If they don’t pass, they are not allowed to repeat 10th grade. The dream of college or university ends if you fail this test. That’s it. Fast forward a year, and I was in a meeting with the Principal at the Amacho Wato school hearing how test scores and attendance had improved greatly as a result of this school project. Outstanding! I am sitting just across the table. It was such an honor! A fun interview with a future leader after the results meeting! Now it is 2016. I have blinked my eyes a few times, and Roots Ethiopia now supports 12 schools in Southern Ethiopia with 13 Outreach Centers! We have grown to operate in 5 zones throughout the region. We have a loyal group of recurring donors who trust the impact their monthly donations make over time in struggling communities. Our growth is astonishing, and our commitment to rural communities never falters. Roots Ethiopia is sleek and smart and we are dialed in deep to the communities we serve. You will love this map created by Desta, Roots Ethiopia Program Officer, and local expert. On behalf of Roots Ethiopia’s Board of Directors and our entire team in Ethiopia, I’m pleased to officially announce 3 additional Learning Resource Projects – Yelignaw Gimbichu in Hadiya, Gedalao, and Walena in Kembata. As always, we will update you as these projects reach completion. If you would like to support a Learning Resource Project in Ethiopia, please donate!